Here’s something to ponder. Most of us who buy ‘the look’ these days will insist on natural fibres, cotton oxford, cotton corduroy, chinos, real suede, and so on. But back in the days we hark to, technology heralded a brave new world of mixed and distinctly unnatural fibres. Many of these products were developments from the oil and petroleum industries anxious to find more outlets for their by-products, some the result of NASA’s need for space age fabric and some, well, just because they could exist. As a six year old I remember once owning a pair of chunky monk shoes that were made of some kind of leather substitute. The salesman insisted to my mother that this was the answer to those school scuffed un-polishable leather shoes. After about two weeks the non-breathing plastic leather had my feet smelling like a tramp’s armpit. Fake leather went the way of the dinosaur, thank God, but mixed fabrics are very much with us in 2011. I just bought a pair of Levis cord jeans (always harder to find than they should be) which for this year are 28% polyester corduroy. This is no space age hard wearing alternative to 100% cotton, but a reaction to an unbelievable rise in the price of raw cotton itself. I read earlier this year that a US denim manufacturer had laid off its staff for a whole year because the entire 2011 cotton bale stock they had forward purchased when the market was lower was worth more as bales than it was as denim! The company sold the bales on the open market rather than waste money turning it into fabric worth less. Uniqlo seem to have introduced a percentage of elastic fabric into almost everything this year. That 3-5% of man made fibre saves them millions of dollars on the price of cotton. But even the so called traditional brands like Levis, that since the 501 craze went mass market circa 1983 (or 1986 if you were Robert Elms) have been seen as endlessly exploiting their ‘heritage’ by issuing bogus vintage models for the euro market, haven’t always been so trad. I was amazed to see this advert from 1963 showing the addition of Dupont Nylon to the denim. 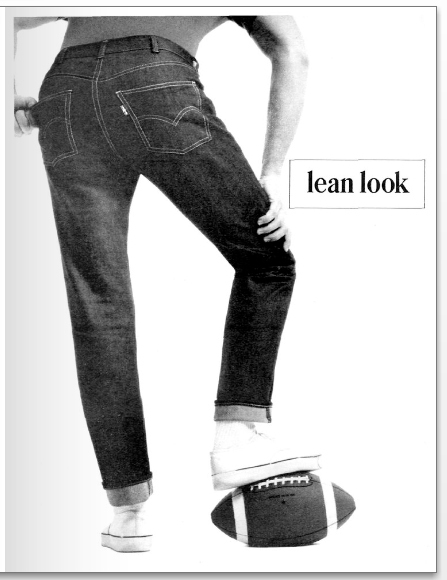 On another note, it’s interesting that when you see old photos of people wearing Levis in the 60s they really were slim fit on the whole. I’ve long had a suspicion that the reissue models are a bit tinkered with. The only model I’ve managed to find that fit like those in the photos were the EU issued 1947 model non selvedge from around 2008. They were very slim and undersized. I recently got a pair of the 2011 selvedge 1947 (not LVC, the PWR model) in the exact same size but the legs are wide and baggy, probably more correct for a supposed 40s model. The LVC 1967 505 has a very slim fit, quite like in the picture above. They’re my favorite jeans. Maybe that’s my next one to re-try Henry? The 505 PWR non selvedge I bought are pretty wide, but then I made the mistake of buying them too big. They do have a great rise. I don’t have a problem paying bucks for the right ones, but in recent years they seem to have messed around with sizing and cut so much! As the cliche goes ‘the past is another country’. We are all fascinated by the style of the early 60s Ivy look, but we are only making rough stabs at it. It’s all interpretations. As I get older my style gets looser and less rigid as I’m increasingly feeling that ‘authenticity’ is a fool’s paradise. After a while you learn to trust your own eye. But you’re right Weejun – the natural fibre thing was very WASPY and Brooksian and not at all part of the ‘popular Ivy’ 60-65 stuff. It was also a later 80s Preppy thing as a reaction to the synthetics of the 1970s. We have absorbed those attitudes into our own contemporary take on the look. I agree John, the early John Simons experience circa 83 was all about a reaction to that. I remember in 86 the owners of the then independent Blazer in Long Acre took the advice of us lowly sales assistants and went to Baracuta to order G9s. Baracuta refused point blank to make 100% cotton shell jackets. One of the reasons why the old company went bust. The British never understood that the customer is always right! Just added a link to the Hollywood & The Ivy Look site John. Will do a post on it tomorrow. Hi, the Levis cords that you bought, was that the expensive LVC ones that Oi Polloi sell? Or did you get a pair of the more reasonably priced ones that you can see on Amazon, but which will not ship outside the US. I’ve a pair of 70s Levis cords, there’s a small % of polyester in them. Michael those Sta Prest ones are bit too rigid looking for my liking, never mind the price. No, I bought the new 401 cords in Harvest Gold and Bittersweet (Tan and Brown in real language – search google images to see the actual colours) and also picked up an older pair of all cotton NWT 752 in a nice taupe colour. Subsequently found a NWOT 501 all cotton golden tan from a private ebay seller. Actually the poly-mix is fine, I have no issues with that – they feel pretty comfortable, although the 752 32W fits the same as 401 34W! I’d probably say avoid the 511 model – despite having a nice navy blue they are Shoreditch low rise stylee. Definitely some out there if you have the patience but Levis don’t make it easy! Alternative is Alexanders of London with their extraodinary 50 colours of corduroy to choose from but they are not slim and need altering. Otherwise, if you have a favourite pair well worth using their custom service and choosing the cord. The sample card they send out by post is mind boggling. Herb Lester pointed out to me the US Levis 514 ‘slim straight’ model that can be found on Amazon.com for peanuts. Lower rise than the models I got though. Thanks, yes the 401 cords look good. Couldn’t find them on the Levis site (couldn’t see anything I liked there) but found them elsewhere. Sadly, Amazon won’t ship Levis jeans outside the US. You can however get Shrink to Fit modern 501s for £39 on UK Amazon. Great choice, if you don’t want to spend £140 on a pair of jeans. I graduated from High School in 1966 in Iowa.My choice of dress was wheat color stretch Levi’s a pair of scotch grain Florsheim wing tips,burgundy color fuzzy socks,a matching burgundy fuzzy V-neck sweater by Puritan over a madras J.C. Penny button down shirt. Still a great look Barry!